4 Point Harness with 3 Pads. Fits All Polaris RZR Models. This 3, 4 point seat belt has sewn in pads for comfort, all black hardware for cool styling and EZ adjusters on the shoulders. The EZ adjusters allow you to adjust your shoulder straps quickly and even if they are dirty or muddy. The seat belt also has a removable sternum strap, and a red latch guard on the lap belt. The lap belt bolts in. The shoulder harnesses can either bolt down or wrap around a roll bar. 4 point, 3 inch safety harness. 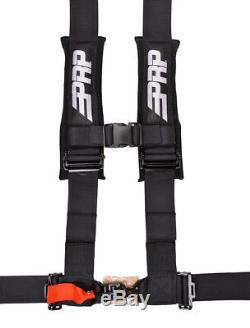 The item "PRP 4 Point Harness 3 Pads Seat Belt SINGLE Black RZR XP Turbo 1000 RS1" is in sale since Wednesday, September 5, 2018. This item is in the category "eBay Motors\Parts & Accessories\ATV, Side-by-Side & UTV Parts & Accessories\Body & Frame\Seats". The seller is "atvgalaxy" and is located in Irvine, California.